As the radio spectrum become more and more cluttered with signals, filters are becoming an even more essential part of any radio equipment. It is absolutely essential that low pass filters are used on the output of the Portsdown and any other wide band DATV transmitter such as DTX1 and DATVexpress to remove harmonics of the wanted signal. Just try tuning your receiver to 439.5 when transmitting on 146.5 MHz! On transmit, as long the transmitter has been designed correctly and you are not over driving any power amplifiers, a low pass filter on the output to remove all harmonics is adequate. 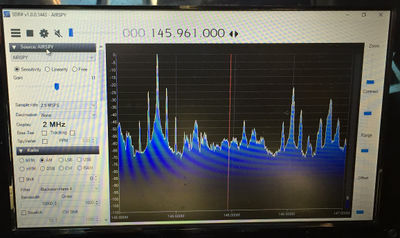 As these 2 pictures of 146 MHz, taken on the Isle of Wight during the BATC December 2016 activity day show, the receive filter needs to be tighter than the transmit filter as you are trying to remove all strong signals that are high and low of the desired frequency. RF pollution is rampant at good portable locations on mountaintops and other high places – anywhere accessible is populated with cellphone towers, TV and FM broadcast stations, two-way radio and pager transmitters, and even amateur repeaters. Most of these are high power, producing signals strong enough to seriously overload the VHF and UHF transceivers we use for contest operation or microwave liaison. The problem often manifests itself as a very high noise level. The advent of broadband MMIC preamps acerbates the problem. Unfiltered, they would be a disaster on a mountaintop like Mt. Mansfield. Even at my QTH, 42 km away from Mt. Mansfield but line-of-sight, the strongest FM broadcast station, at 107.9 MHz, is -17 dBm on an FM turnstile antenna. Amplified by 25 dB or more, this is more power than most receivers can handle, even out of band. This applies even more so to the input of any ATV or DATV receiver which uses a wide band satellite tuner in the front end (and they all do!) - this is because these tuners were designed to be used in a "closed system" and connected directly to an LNB on a dish pointing at the clear sky. This is very different to being connected to a "wide band" yagi antennae which will also pick up PMR and paging systems, short range devices and broadcast transmitters many of which are digital and just produce white noise so you cannot tell you are being overloaded by them! Sharp filters can not be made using surface mount components on a PCB! However, good filters are actually quite easy to build with just a medium weight soldering iron and tin snips! Combline filters perform well and are much easier to make than interdigital skills and anyone with reasonable drill and hacksaws skills can make them. The 432 MHz combline filter in a metal tin is really easy to build and would make a really good rx filter for 70cms - put after your wideband SPF5043 or PGA103 pre-amp and before your tuner input. Another interesting paper by Paul with some simple practical combline designs, this time made in the standard Hammond Diecast boxes - these are high performance band pass filters designed to cure the problems when using wide band pre-amps - as illustrated at the top of this page! Interdigital filters are not, as their name suggests, digital filters but very high Q filters which normal are used for bandpass filters and they are quite easy to construct if you have any metalworking skills. If you want to design one from scratch Doug, VK3UM, now sadly Silent Key, has a calculator http://www.vk3um.com/interdigital%20filter.html. 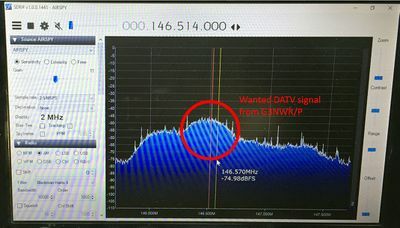 Jim KH6HTV has an interesting paper on his website. This page was last modified on 21 September 2017, at 10:28.